I very much love raised bed gardening for several reasons. 3. Beds warm up better giving you longer season early in the year and later in the year. 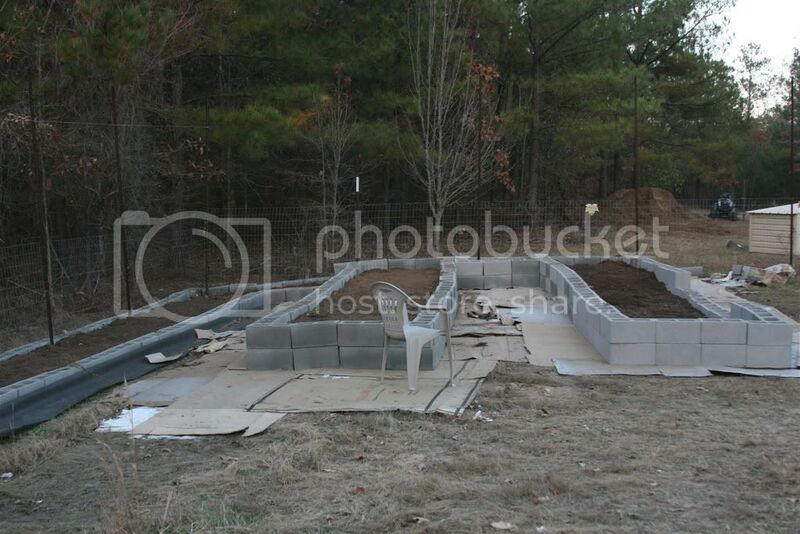 I used concrete blocks for my raised beds. All my beds are approximately 4foot wide by 20 foot long. At 4 foot I can reach the middle from both sides of the bed and not have to worry. I put down cardboard to keep the weeds down to a minimum and it last about 2 years before it starts breaking down. Its safe under USDA Organic standards to use. I then fill them up with a layer of aged compost then a layer of topsoil followed by another layer of compost and another layer of topsoil. I do this until its filled to the top. The holes in the concrete block are good for putting pvc pipe and bending it creating a hoop. This is good for draping floating row cover or greenhouse plastic over to extend your season. The floating row cover keeps the frost off as well as keeping the flea beetles and other pest away from your crops. 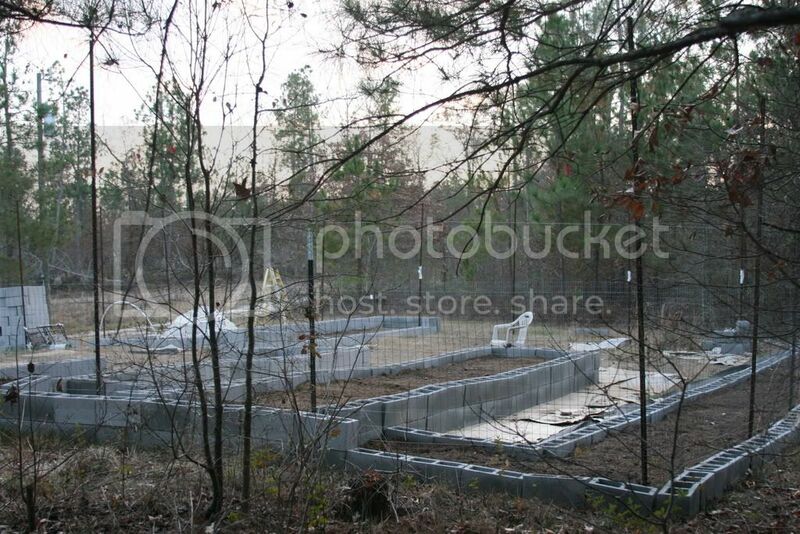 This first one is the backside view from the woods. 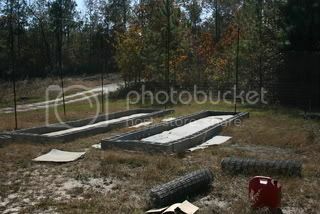 I have to fence everything in because of the deer and rabbits as I live in the woods. The back row goes all the way across this is good for beans to grow up the fencing. It is also 3 foot wide since I cant reach it from both sides It had to be made narrower. The other two beds are both 2 blocks high. It takes alot more soil to fill them in but its worth it for deep rooted crops like carrots and the like. its also nicer since it just right for sitting height and not having to lean over as far. Thank you so much for sharing this. It looks like it took alot of work to set up, but once it's done it's easie to maintain. I too love my raised beds. They are made of untreated lumber, stained on the outside and lined on the inside with cardboard and fabric to keep weeds down and help protect the boards a little. I love the idea of bending PVC for extending the season, Pixel, so I think I will take some larger pipe, hammer it into the ground and then I can bend some PVC poles over that. Probably so I can start early this Spring. rebar is cheap and works well for the pipe as well you can hammer a small piece of rebar in the ground then cover it with one end of the pvc pipe bend the pipe and cover the other side of the bed. I like the idea of cardboard underneath..............nice set-up. Looks great, I will warn you about PVC piping though, it contains plasticers that leak out of the polymeric structure of the compounds into the soil. These chemicals can then slowly poison the plants and they actually slowly posion us as well. So, it's something to think about. true pex is probably a better solution as it doesnt contain the bad pvc stuff in it. opabinia51 wrote: Looks great, I will warn you about PVC piping though, it contains plasticers that leak out of the polymeric structure of the compounds into the soil. Good heavens! What next?? I had no idea. Yes, the problem is that PVC piping is used everywhere in North America to supply not only our plants but, us with water. Polyvinylchloride itself is a stable polymer but, very brittle so, to make it soft and pliable they need to add plasticizers. Anyway, to my knowledge polyethylene is stable enough to not use plasticizers, metal definately doesn't use plasticizers and I'm sure there are other plastics out there. Plastic piping is definately cheaper and easier to use but, I really don't like using plastic anything because it is a non natural chemical and doesn't break down quickly at all. It did come from petroleum in the earth and eventually when provided with enough heat it will be reconstituted back to the earth or perhaps the galaxy but, it is not going to breakdown on any human timescale. Don't get me wrong, I do use plastics. I just think that we need to try to limit the use of them. And definately think twice about using PVC even though it is incredibly convenient. Opabinia, you make some really good points. Thanks so much. Ive seen light weight wire used as hoops for the floating row covers. Probably alot better for the environment that plastic pipe. You answered my question about raised beds! I have been struggling with my soil for two years: thick clay! I have reworked the soil over and over as deep as I can go, but by the middle of the growing season it is back to clay. I have tried Soil Pick and Gypsom to help get air into the soil and it doesn't help! Surprisingly enough, the only thing to ever have survived and prospered were my tomato plants! Go figure. This year, I discussed the subject with my husband about trying a new approach to our evil yard. He liked the idea, but knew of the hard work ahead of starting over. I reminded him that every year is starting over with our backyard! I also didn't know how to start or what to use for materials: lumber or brick. You have all given so many ideas and I didn't even have to ask! The cardboard is a great idea to keep the weeds and the clay from coming up and leeching into the good soil. I am so excited about the prospect of my veggies getting past 2 inches in hieght! Thanks so much! gardenbunny the cardboard is good for clay soils as wel because when it does finally break down it turns into crumbly fine particles and helps. I would also try mulched and cut up leaves. thanks pixelphoto! I think that is what we will do. I have already begun collecting cardboard boxes from our local stores and I think we will use those blocks or bricks (whichever turns out cheaper). I can't wait to get started! I hope to finally have a successful garden!